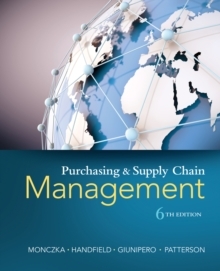 Providing a solid managerial perspective, PURCHASING AND SUPPLY CHAIN MANAGEMENT, 6e draws from the authors' firsthand experiences and relationships with executives and practitioners worldwide to present the most current and complete coverage of today's supply management process. The text includes critical developments from the field, such as cases from emerging healthcare and service industries, procure-to-pay redesign, supply risk, innovation, sustainability, collaboration, and much more. It also examines key changes in supply management and the impact of the global economy and ongoing business uncertainty on continuous cost and value management across the supply chain. Numerous real-world cases and captivating examples give you contextual insights and knowledge into the strategies, processes, and practices of supply management. PURCHASING AND SUPPLY CHAIN MANAGEMENT, 6E equips future managers with a thorough understanding of the impact that purchasing and supply chain management have on the competitive success and profitability of today's organizations.